“We / us” means The Bali Adventure Limited is a company registered in England and Wales with company number 10220160. Registered Office: 304 High Road, Benfleet, Essex, England, SS7 5HB. "The Event", “The Package” Means any holiday, accommodation, activity or function organised or advertised by us. "You", “Customer”, “Traveller” Means the person who has signed the booking form and or given a deposit or the full balance for one of our holidays and includes all the people on whose behalf you have signed or given a deposit. We understand sometimes plans change, if after your booking you would like to make a date change, you can. An administrative fee of £25 is applicable. Please contact us with your request at least 30 days prior to departure, or full payment will be due. Any date changes after the 1st will be subject to £199 fee. We understand sometimes plans change, if after your booking you would like to make a date change, you can. An administrative fee of £25 is applicable. A 50% of the final cost will be taken and this will be non-refundable. Please contact us with your request at least 30 days prior to departure or full payment will be due. Any date changes after the 1st will be subject to £199 fee. Need to cancel your trip but you have a friend who would like to take your place then the normal cancellation & booking policy is applicable. We cannot replace your original booking with another person. If you need to cancel your booking you must do so in writing (by mail or e-mail). If you have paid £99 deposit you will be charge a £100 cancellation fee. If you have paid £1 deposit you will be charge £198 cancellation fee. For cancellations received more than 30 days prior to departure the deposit will be lost and you will be charge either £100 or £198 cancellation fee. For cancellations received more than 30 days prior to departure you will be charged 50% of the tour cost. Delayed, rescheduled or missed flights. Pandemics, Epidemics, Bird flu, Swine flu, SARS, Leprosy, Shingles, Pink eye, Rickets or Chaffed lips. However, you may be able to have any cancellation fees refunded by your Travel Insurance company – subject to their terms. Tours may be cancelled due to political issues and natural disasters for example volcanos, earthquakes and hurricanes. If a tour is cancelled due to these circumstances clients will receive all payments back but ‘The Bali Adventure Limited’ will not be liable for any other cost such as flights, clothes, travel insurance or other costs incurred. You will need to have Travel Insurance that covers you for your Bali Adventure. You must enter your travel insurance information in the login section at least 15 days prior to departure. Sometimes it rains in Bali or something doesn’t go to plan. So we might have to change the itinerary. If, due to circumstances beyond our control, we are unable to offer a particular activity, we will try replacing it with a different activity of equal or greater value. Please understand that in some situations, this is not possible. The rainy season and things to be aware before booking: The rainy season in Bali is not bad compared to other Southeast Asian countries. Short spurts of tropical rains are always followed by sunshine. Most of the rain occur during the nights, although some days could bring bad luck and potentially rain non-stop throughout the day. Unfortunately not everything is safe to participate in if the weather is bad e.g hiking up the active volcano or hopping on the boat to Gili T so the itinerary will be flexible during rainy months. We will mix and match activities so we can cater for your travel experience as much as we can so you don’t miss out on anything! Any questions you may have regarding rainy season feel free to ask us ! Please note, accommodation may change from tour to tour depending on season, availability and the total number of guests on a tour. We’re afraid The Bali Adventure will not be held responsible for any loss or theft of baggage or belongings. Travel Insurance is compulsory for The Bali Adventure. We recommend that you lock your bag with a padlock when left unattended. We know that everyone wants to have a good time. All we ask is that you agree to comply with the authority and decisions of The Bali Adventure Crew. We reserve the right to ask anyone who is deliberately not complying, or causing trouble, to leave the group. In the event you are asked to leave the group no refund will be given and you will have no claim against The Bali Adventure. We ask you respect the Bali culture and your fellow travel companions. We cannot be held responsible for any loss as a result of failure of any third-parties (including Airlines, Tour Operators & Hoteliers), however we will give every reasonable assistance in helping you to resolve any dispute. The responsibility of The Bali Adventure as a Tour Operator is limited. We are not liable for any personal injury, death, damage, loss, accident or delay which may be occasioned either by reason of any defect in any vehicle, or through the acts of default of any company or person engaged in conveying you or carrying out the arrangements of the tour or otherwise in connection therewith. Extras may be booked before the tour begins such as extra accommodation. In the event you are asked to leave the group no refund will be given and you will have no claim against The Bali Adventure. Shared accommodation may be mixed gender unless requested. 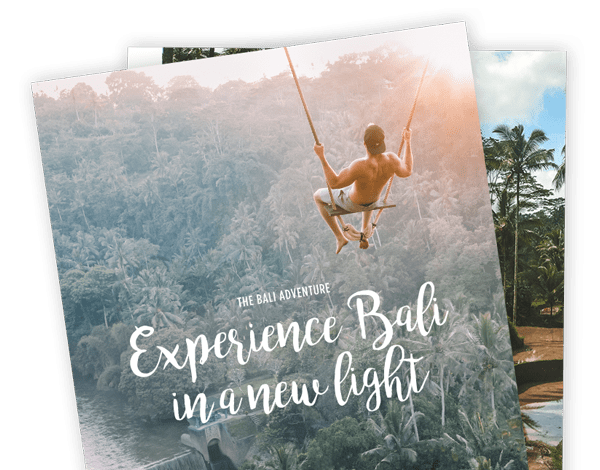 When purchasing from The Bali Adventure your financial details are passed through a secure server using the latest 128-bit SSL (secure sockets layer) encryption technology. 128-bit SSL and is the industry standard. If you have any questions regarding our security policy, please contact us at info@www.thebaliadventure.com. Your email address and personal information is safe with us and we will not share to anyone else. The Bali Adventure reserves the right to withdraw or change the terms of any special offers without notice. If you have any questions regarding our Terms & Conditions please feel free to Contact Us. We may change or modify all of any parts of our Terms and Conditions at any time and such changes or modifications shall be effective immediately upon their publication. You should review these regularly to ensure you are familiar with the most up to date version. Browsing and continuing to access or use our Website constitutes your acceptance of the updated terms and conditions and you agree to by bound by the updated terms and conditions.